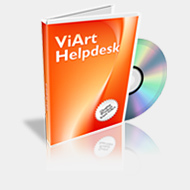 ViArt HelpDesk is a software solution devoted to make relationships with your customers as smooth as possible. It enables end-users to submit support tickets via an online form or through email; at the same time, reps given by your staff via the system are sent as emails as well automatically. HelpDesk facilitates the whole process of ticket managing: you can easily track all incoming support requests, view ticket history and even use predefined replies. The system supports both multiple departments and managers enabling you to re-assign certain requests to managers responsible for certain problems or supported products. Setting up different customer ranks and ticket priorities allows distinguishing more urgent problems and thus ensures their faster solutions. Comprehensive search and overall statistics are available.